Rice is the staple food in Southeast Asia and in many parts of the world. But it’s not just a food that fulfills hunger. Rice has enriched the cultures of many Asian societies. In Thailand, asking, ‘Have you eaten rice today?' is a way of saying, ‘How are you?’ In Vietnam it’s proper to say, ‘please eat rice’ before every meal, even if the meal doesn’t include rice. In Brunei elders remind the children to finish their meal to the last grain of rice because if not, the rice will cry. Indeed, rice is a precious commodity in Southeast Asia. Thailand is the world's biggest rice exporter while Indonesia is the largest rice consumer. Other Southeast Asian nations like Cambodia, Vietnam and Burma are notable rice exporters too, while the Philippines is the world's top rice importer. So it’s not at all surprising that many people in this part of the world are worried over reports that recent floods in many Asian countries have affected the rice output in the region. The reduced rice supplies plus the rising demand for the staple in China and India could affect the price of rice. And the rice problem is in fact being made worse by rice smuggling—a trade in which unscrupulous rice traders collude with politicians and agricultural officials in hoarding rice supplies. This further creates an artificial crisis, which jacks up the price of rice. Rice is a politically sensitive commodity since price fluctuations in the market could easily undermine the stability of governments in the region. Many people here are ready to blame the recent unrest in the Middle East for the skyrocketing oil prices but rice price increases are unacceptable in societies where planting of rice is a thousand-year-old tradition. Politicians who can’t adequately explain why consumers must pay more for a cup of rice risk losing public support and governments that fail to address the rice needs of their constituents will definitely incite public indignation. It’s not just empty stomachs that arouse the anger of many people in the region; they become rebellious too if they cannot eat their rice. Rice actually has the potential to spark an uprising. The August 1945 revolution in Vietnam was led by hungry peasants and urban dwellers, who stormed public halls demanding food, rice and independence. The slogan, ‘Break open the rice stores to avert famine’ mobilized the masses which ended the colonial occupation and paved the way for the establishment of an independent democratic Vietnamese nation. The threat of a ‘rice revolution’ caused by rice shortages is always present in agricultural societies. A few days ago, a Philippine newspaper leaked a government security report, which warned against the escalation of violent social protests and even riots if the government fails to prevent a rice supply crisis this year. So far the government has denied any such issues. This scenario could also become familiar to other Southeast Asia nations. 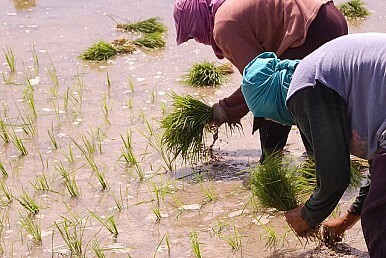 It’s why it should embolden policymakers to review their agricultural laws, especially programs on how to boost the productivity of rice farmers. In the Philippine case, something is wrong with an economic policy that prioritizes the planting of cash crops to be exported to other countries over the planting of food crops needed by the people who are suffering from hunger. The government can also implement emergency measures like arresting rice hoarders and smugglers. Price controls and handing out of subsidies must also be included as options even though economists are sure to reject them. Persuading the people to reduce their rice intake and change their diet is not enough. Nothing short of a comprehensive overhaul of rice and agricultural policies is needed if governments really want to avert civilian and peasant unrest in the future.